by John Coy, illustrated by Joe Morse. Well, the title gives one a pretty good idea of what this book is about, I'd say! It tells the story of James Naismith and the invention of basketball. 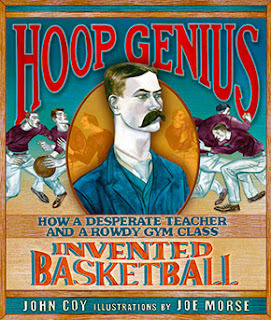 Though not a wordy book, Hoop Genius manages to tell about why Naismith wanted to invent the sport, his inspiration for it (a childhood game called Duck on a Rock), the first two games played, the first games played by women, and the inception of basketball into the Olympics! It's fun, well structured (plotted? Not sure that plot is the word), and accessible to those who don't like to see too many words per page. 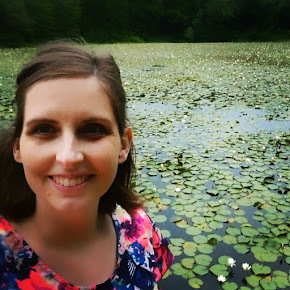 :) There was one paragraph that I found super awkward and had to re-read in order to parse properly, but other than that the writing does a great job of staying out of the way of a cool story. The illustrations intrigued me -- deep hues and high contrast make the book eye catching. And so many good pictures of people playing basketball! All of the pictures where subjects are in motion were spot-on for me. Some of the illustrations of people holding still were not so golden in my opinion. Take the cover as an example. Though the players' bodies are perhaps out of proportion, it lends a sense of motion to the image. The center portrait of Naismith, however? Just odd. There were a few other pages that bothered me in this way, too. Still, well done overall, and if you're going to illustrate a basketball book, you'd better be good at depicting people in motion! Super Bonus: All the awesome moustaches! Also the endpaper, which is a facsimile of the first draft of the rules of basketball. This book is nominated for the 2013 Cybils in the category of Elementary/Middle Grade Nonfiction. My views, stated above, are my own, and do not necessarily reflect the views of the round one judging panel, of which I am a member.